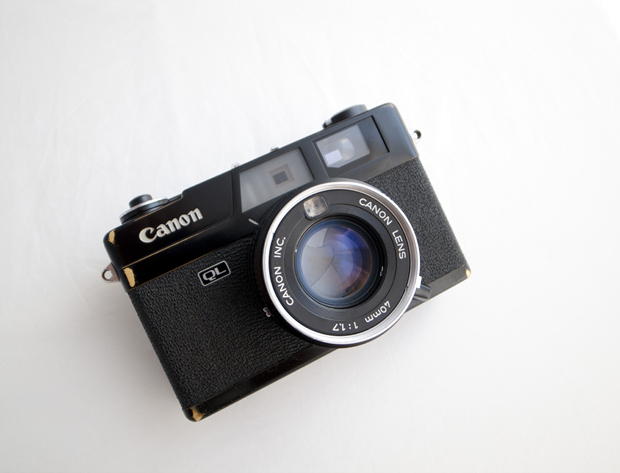 In the 1970’s the Canonet became a household name, with over a million units sold. So let’s have a look and see why this camera became one of the best selling fixed lens rangefinders ever made. During the 1970’s several of the great camera makers from Japan decided to try their hands at making a fixed rangefinder camera with a fast lens. Lots of them were made, and some of them were great, but none was more popular than the Canonet. With a fast f1.7 40mm lens, Auto exposure and a flash hotshoe this camera was a winner in many aspects. But it was and still is the price the is the real winner. This camera was very cheap when released and is still not terribly expensive, you can pick up a beater for as little as $40. Though you are certainly going be paying a fair bit more for the black version, the rarest and most desirable version of this fantastic camera. The camera is small and very easy to handle. If you wanted a size comparison it would be roughly the same size a Minolta CLE, though a fair bit lighter. 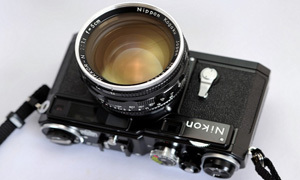 The camera is well made and has a nice bright 0.6 rangefinder. Inside the finder it is simply laid out and not overly cluttered. Although small for my tastes it is bigger than many other compact cameras and is more than enough for most situations. The meter is simple and the actions are simple too. This is a very easy camera to use, it was designed for the mass market, so there was no point in making it overly complex. There are no little idiosyncrasies, this is a walk the line camera, but a very good walk the line camera. Canon has never really been known as a company that makes eccentric cameras, and this one is no exception. What Canon do is make very capable cameras that everyone can use. The Canonet QL17 (QL stand for quick load, in case you were wondering), boasts a leaf shutter, making it quiet and very stable. 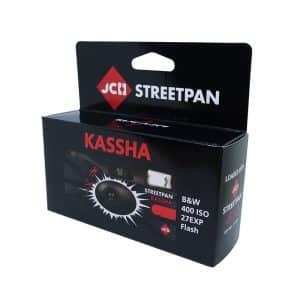 With a top speed of 1/500th it also offers flash sync at all speeds. This is a very good stealth camera, especially if you have the black version. It is fast, quiet and easy to stuff into a pocket at a moments notice. One of my favourite things about this camera is the incredibly short focus action. At only 45 degrees it is almost over before it has started. I was a little bit surprised the first time that I used it and I thought it might be jammed, as I am used to a larger reach. Once you get used to this it will be an extremely fast focussing action. The camera even has an idiots guide on it for less experienced photographers, with the sunny and cloudy settings on the barrel, so that you don’t have to do anything. But even a complete begineer will be able to pick this thing up and be shooting manually within a week. The quick load function means no fiddling about making sure that the leader is aligned with the spools correctly, just load the film to the coloured tab, close the door and crank the film advance. If the advance doesn’t turn the film is not loaded, very simple. 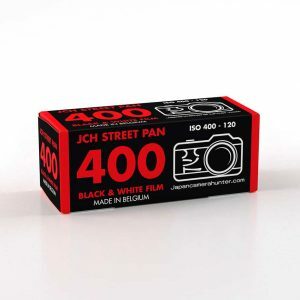 This makes changing film a breeze and helps you to be ready for the moment. The AE mode is well balanced and very simple to use, this makes the camera is easier to use. It is easy to switch to manual mode too and you can make the choice between the two whilst on the fly. Activating the AE lock could not be simpler too, just slightly depress the shutter button and you are there. There are some drawbacks to this camera though, as not everything is perfect. When this camera was produced, mercury cells were the norm. But this is no longer the case. There are substitutes though, you can get an adapter to use modern cells or you can do what I do which is buy a Wein mercury replacement zinc air battery. The zinc air replacement means that you don’t have to have the meter adjusted and you can carry on as normal. As this was a mass produced camera for the lower end of the market people didn’t generally look after these cameras, so you may find that your camera is battered. Things to look out for are rotten seals, broken light meter, mould and worn out rewind levers. Whilst you can have the camera repaired by a few places, they are generally so cheap that you might find it easier to just replace the camera, unless it has some kind of sentimental value. But, if you have the black enamel version of this camera, then it would be a safe investment to make sure this thing is in working condition. The black is rare and looks fantastic. If you find one, hang on to it and take care of it, it is a beautiful camera. I have had a lot of fun using this camera, and I have been surprised at how good the lens is. 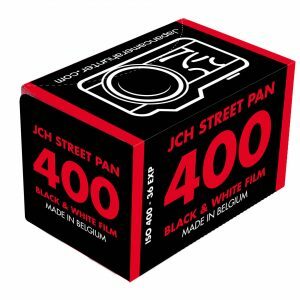 This is a great camera for the price and will give you a lot of happy film moments. They are easy to find as so many were produced, but if you want a black one you might have to look a bit harder. There are several aftermarket repainted models on the market too, I have seen a hammertone version recently. If you are looking for a budget rangefinder or are just starting to get into the film photography then you can not go wrong with the fantastic Canonet QL17. 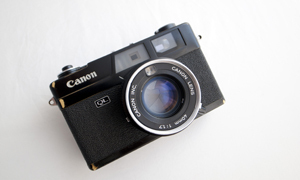 The Canonet is a great little camera, I like the fixed-lens rangefinders of the era. Another of that vintage is the Olympus SP and RC – both excellent compact bodies and really nice lenses. They are also super silent cameras. My dad had a QL 19 (I think) and my best friend’s dad had a QL17 GIII. I wish we still have them! We upgraded to SLRs and forgot about them. 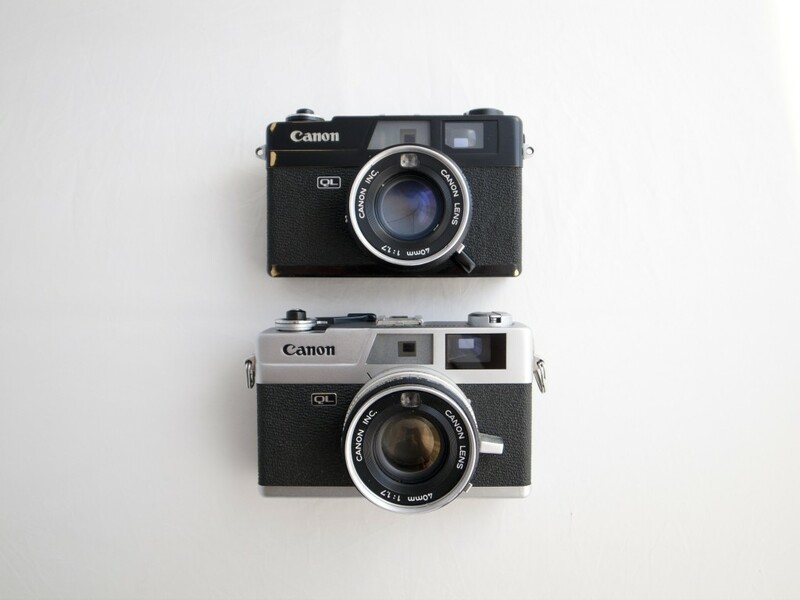 Agreed, the Canonet’s a fantastic little camera, well-balanced for what it is. Since picking one up last September I’ve used little else and shot alot more film in the process. I love my Canonet. 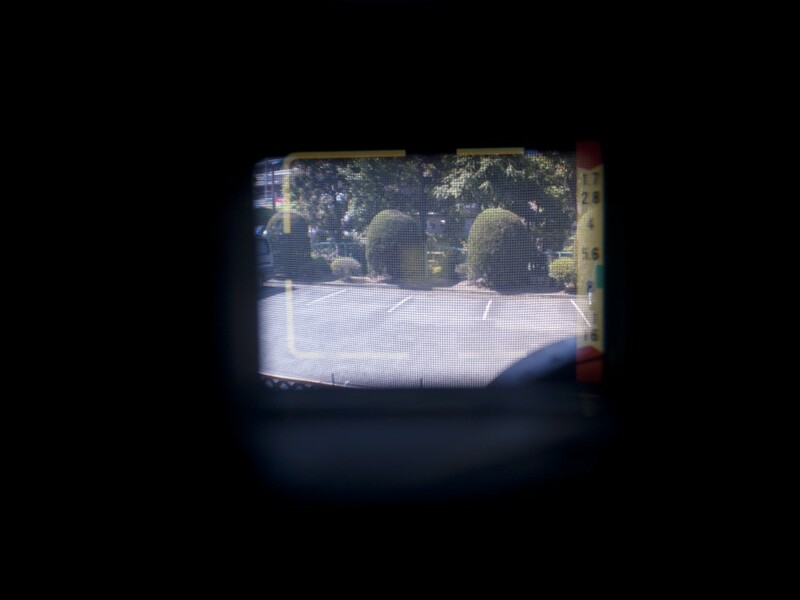 I bought one of eBay recently, rangefinder spot was a quite faded. But within an hour of using it just stopped working. Shutter doesn’t fire anymore unfortunately. With camera’s in this price range it is often cheaper to just ditch it and buy a new one than repair it. I did love the size of the camera, but the Olympus 35 RC is even smaller so that’s what I’m looking at now. I’ve been shooting one for about 8 years. A QL17 GIII. Dependable camera. The only thing that bothered me is it refuses to shoot if there isn’t enough light in AE mode. Infuriating for drunk photography. I love Canonet QL 17, I had mine since last September. It is small, discreet, short focus ring. Only the drawback is when you attached the radio flash trigger on top of it (if you try Charlie Kirk style, there lots of chances the flash did not fire. I tried it with 2 different Canonet QL 17. Either the canonet wiring faulty or just my radio trigger fault. I bought a QL17 on ebay and it’s been the best introduction to film photography and rangerfinders in general. Such an easy camera to use and delivers great results. I said to hell with the meter and the batteries (have never used either on mine) and instead use the sunny 16 rule, or external light meter on my iphone. With zone focusing, and pre-focusing my settings, I’m much quicker on the street than diddling with the functions on my DSLR. I love this camera and it’s forced me to “learn” photography by shooting all manual. I got a QL17 off ebay a while ago… it was in great shape…. the only drawback was the shutter was a bit soft… and unpredictable. Sometimes you’d press the shutter button and the camera clicked…. other times it took about a second before the shutter closed…. and I never found a pattern to what was happening with that. Hi Nocklebeast, it seems your Canonet shutter blade lubrication has dried up a bit. You might want to try to shoot it several times at slow speeds (1/4 – 1/15), it helps to loosening up the dried/sticky shutter problem. If it’s still insists, time to CLA or buy a new one. Good luck! After buying the standard canonet giii ql17, I wound up buying myself the black model. Of course it’s no different, but to have it in black just makes it that much more awesome. because of your cool recommendations, I went ahead to buy a silver one, which also ended up for me to get the black piece. Having said that… both pieces froze up after or during 1 roll of film! Any idea if this camera will always have this problem even after a CLA?? Last week I got a QL 19 and load it with an Ilford HP5. I’m so curious what i get out in the end. QL-17 e se ela seria recomendavel para servir a uma pessoa que quer começar como profissional. I’ve recently picked up my canon ql17 camera again and I am enjoying it. I bought it used in1986 but it is in great shape, and it’s the all black version! I didn’t realize until I read this that the black one is rare. :). 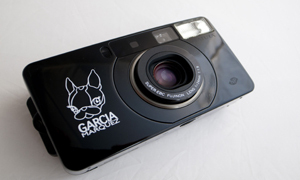 This little camera is produces great, sharp pics! Thanks for the great review of one of my favourite cameras. I have fond memories of hunting down these in the flea markets of Europe. BTW my site http://hipsnap.com.au often stocks these if you are an Australian interested in obtaining one. I’m very interested in buying your camera! Would you be willing to ship to the UK? Email me, please! It is my understanding that the QL GIII was made in Japan and Taiwan; is there a difference in quality? I current reside in Taiwan and they are plentiful here, but oddly enough most of them are from Japan…I am just curious, I would buy either in a heartbeat for around 100, which is what they go for locally. BTW, I love this site JCH! I just picked up a QL17 GIII on Craigslist from a guy whose father was a Canon rep. 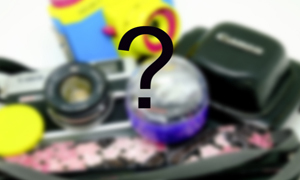 The camera had never been used–the mercury battery was still sealed in its original plastic bag. Had to replace the seals and clean the haze off the viewfinder, but the camera is now like it just came off the shelf. Can’t wait to get out and use it! I have both the cameras you mention. I would go for the Canon if you want to use it. The Yashica, although it looks great, takes an oddly sized battery which was discontinued a long time ago, I think because of the lead content. Modern replacements are hard to get hold of, whereas a battery for the Canon should present fewer problems. I just bought one of these at a market in Hong Kong. It works great, but I’m curious to know if you can tell me how it got to be gold (Canon in red) with a faux snakeskin wrapped around. Did the previous owner make these adaptations themselves or was this a real model? Thanks for any info! My parents bought me the silver version of the QL 17 for a photography class I had in the 8th grade in the late 1970’s. We developed our own film and made our own prints, and many of the lessons I learned then are still applicable in the digital era. 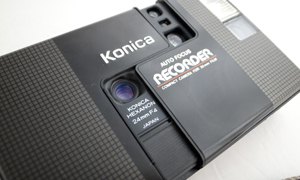 I loved this camera! I remember how unique it was to be able to take pics indoors without flash, and have the background not be all black, and softly out of focus. I have two advanced Nikon digital SLR’s today, but I wish I still had this camera. I’ve got one Canonet QL17 GIII in black with (cap, lens hood and original flash Canonlite D) all in very good state! But actually, I prefer to use my new Leica. I just picked up my first Canonet QL17. I found it at a garage sale sitting next to another Canon, a VI-T with a 50mm F/1.2, for a total of $4.00 US. The VI-T is going to need a bit of work but the Canonet cleaned up nicely it seems like it just needs seals. I am looking forward to putting them to use. On your photos it looks like the black ql17 is a bit smaller in size than the silver ql17. Is this correct or am i just seeing things? Great review! I ended up choosing this camera as my first step into the film world and I was really surprised at the amazing quality and sharpness of the lens. I got very lucky and found a black version made in Japan with the original lens hood to boot and it has an amazing patina to it with brassed corners. I also find the 40mm focal length to be absolutely perfect for almost every scenario. Very fun little camera! Anyone else curious to know of any variation in lens vs the newer GIII model? Canon listed ‘lens performance improvements’ or something along those lines, no details to be found anywhere. how does the Wein battery hold up ? lasts long? any leakage or reliability problems? Would like to find a Wein Battery, any ideas? While cleaning up I found a QL17 G-III. It has both my father’s California and Texas driver’s license numbers engraved on the bottom. I don’t remember my father giving me this camera. My father moved to Texas in the early 80’s so he may have given me the camera while I was still living in Hiroshima. The seals are rotted and the EPX625 battery is dead. I plan to clean and restore back to working condition. I will shoot a roll of film on my next visit to Japan. I return twice every year. This is a very fast lens, and canon picked a nice piece of glass to do it. I too heard it makes a really great street camera, and the pictures come out looking awesome. I like the silver one better, it has that 70’s look to it. The g111 was the last generation something like late 70’s till 1982. I just got a canon G11 that was built in 2010, just got it a few days ago and instead I am here now looking at this Canonet. I bought mine new in 1977 from 47th St. Photo in New York. Back then we didn’t have hipsters roaming the earth, just hippies showing their age. I just got it back from “rehab.” Now it can use 1.5 volt batteries. I have my Dad’s too. It’ll be needing rehabilitation as well. I am in the market for leather case for my QL17 and have a question. Does anyone know if the QL17 and QL19 have the same size bodies? I’ve seen several cases listed online for QL19 and they look similar to what I’ve seen w/ QL17. Bellamy, I figure you might know being you deal in cameras! Peace. 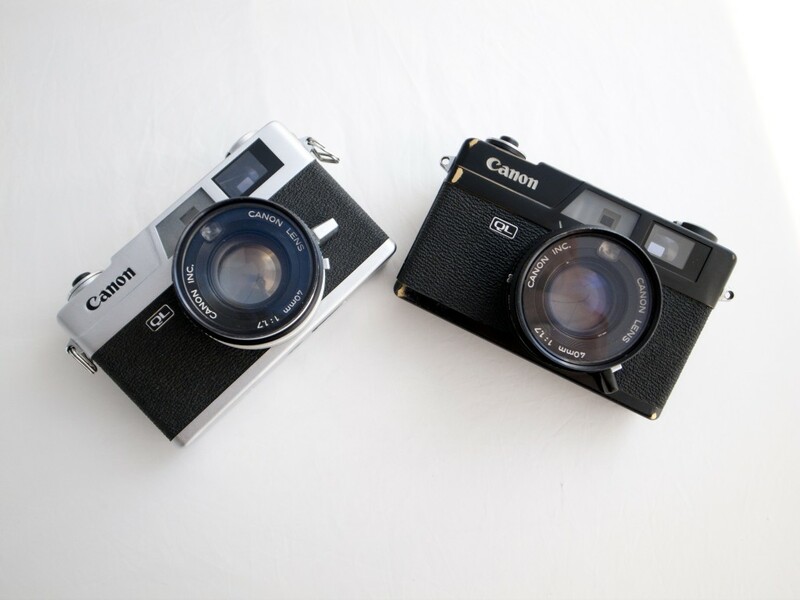 I have both the Canonet 28 and the QL 17. Wow, the 17 is really a great upgrade! Though I did have to pay twice as much ($40) over the 28’s $20. I found a source for the 1.35 batteries. Battery Junction . com has the Exell MRB625 zinc battery at 1.35 V for $5.95. I bought a excellent condition QL17 GIII on ebay recently. Ran a test film through it and the results are really quite superb. The meter and rangefinder focussing are spot on and the lens is exceptionally sharp. The camera has been well looked after with only some tiny scratch marks on the back, the optics are perfect! I can’t wait to use it more and get back into real photography. I just picked up the QL17 model that had its first year of production in 1965, $35 at a thrift store. I was okay with that considering what I’ve seen them for. The shutter seems properly responsive at various speeds, lens looks excellent, and body looks too clean and scratch free to believe it got much use. Aperture a bit sticky, but that seems to be loosening up. I get that the black version is more highly esteemed, I think it looks great. But I also have never had any problem liking silver versions…of any camera. It’s purely aesthetic, and quite honestly the ‘black is better’ is more than a little overblown. In fact I will say silver looks just as good…most times. 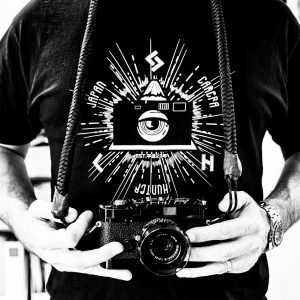 I am drawn to cameras and to purchase them often purely for their looks as much as other things. I understand the recommendation to fix a black version, but maybe let go of a non-working silver version and just find another buy. I get it, I really do. But really, that’s silly. If you have a QL17, G3 or otherwise, and you feel you want it repaired: do so, be it silver or black…in my humble opinion. 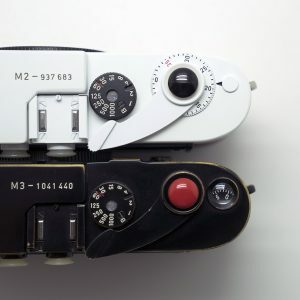 If I had a black one, sure I would like it as much as the next guy, but I’ve not felt the same inclination to draw such a sharp distinction between black and silver versions of various cameras as I see in many write ups . No offence intended to the writer of this review, just airing an opinion. hey! any idea which part of taiwan im able to purchase this? This, the Olympus RC and the Vivitar ES are my favorite rangefinders to shoot with. All three deliver superb results. Question: If a person found a decent silver camera and a decent black camera- how much more money do you believe the black should bring?? Thanks. I’ve just bought a QL17 for $25. The seller told me it was not usable, so I took it today to the repair shop. They tested the camera and gave it back to me without charge because it is all right! So it’s time to get a roll of film and enjoy it! Greetings and best regards from México.